Just a week after the debut of iOS 8, Apple has provided an update for its newly upgraded mobile operating system, addressing a number of bugs related to HealthKit, Photos, third-party keyboards, Reachability, and much more. But the update was quickly pulled after iPhone 6 users began experiencing serious bugs. Update: Readers are advised to hold off on installing iOS 8.0.1, as the software update has introduced a pair of serious bugs for a number of iPhone users, specifically killing cellular connectivity and disabling the Touch ID fingerprint sensor. The original story on iOS 8.0.1's release follows. 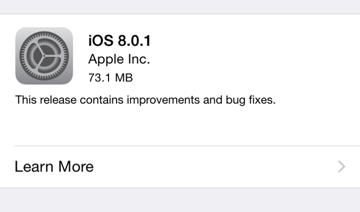 iOS 8.0.1 can now be downloaded from the Software Update section of the iOS 8 Settings application. Apple's short description of the update simply states that the release "contains improvements and bug fixes." Addresses an issue where third-party keyboards could become deselected when a user enters their passcode. iOS 8 launched for iPhone, iPad and iPod touch last Wednesday, ahead of the debut of the new iPhone 6 and iPhone 6 Plus. It gives users access to a wide range of new features, including third-party keyboard support, Notification Center widgets, extensions, Hey Siri hands-free voice activation, Continuity between devices running iOS 8 and OS X Yosemite, and much more. AppleInsider's ongoing iOS 8 Tips series gives readers a detailed rundown of some of the more useful features found in the new operating system update. For example, Siri can now recognize songs that are playing, annoying text message conversations can be silenced, and new Family Sharing accounts allow applications, music, movies and other iTunes content to be shared between family members.